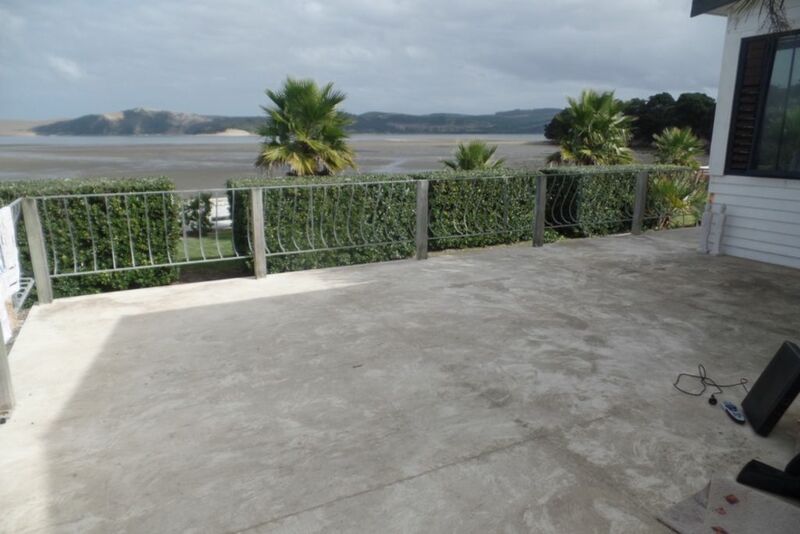 Only steps to the water, safe for all water activities, this property has amazing views across to the dunes or to the night lights in Opononi, a short five minute drive away. Set on 1/2 acre of flat land with nice easy care gardens with a large deck, your options are endless. Fishing at the point, a 10 minute walk away is a local spot for catching dinner, kayaking right in front of the bach, numerous bushwalks, reading books, watching sunset/sunrises, looking out for seals, orcas, collecting pippi's, cockels or scallops when the tide is out or simple crab hunting to name a few. Koutu Point Boulders are an attraction that most visitors to the area see, learn about Opo the Dolphin who attracted thousands of visitors in the 1950's, visit the monthly Saturday local market, cross the harbour to the Sand Dunes to spend the day sliding down the banks or cross the bar into big game fishing territory! With only one neighbour this property is very quiet with plenty of car parking space too. You will not be disappointed. A Four Square, Bar, Restaurant, Cafe, Information Shop, Garage, RSA, Ice Cream, Fish and Chips Shop and the Copthorne Hotel all close by to cater to every need. We got to the property at about 4.00 pm, used the lock box code given but couldn't open it. Frustrating in the rain. Couldn't get any signal on the phone. So drove along the road and found a very helpful man at a nearby house, Harry Barlow. He said there'd been a few problems with access to that property. He phoned both Linda and Paul but both phones were on voicemail. Got hold of Pania, the cleaner, and she gave us the correct code for the lock box. Found, when we got home, an email had been sent to us at 4.35 pm that day but that was of no use to us at the time away from email access. Got into the property okay but the TV didn't work. It wasn't tuned and I didn't have any luck in trying to tune it. Other than these two problems, all else was well with the property and it was a nice, well-equipped place to stay. Thank you for your feedback Patricia, I do apologise for the two different codes being sent to you. Homeaway advised me that the New Zealand site does not have the capability to send out the automatic instructions so I was not aware you had received the old code. I sent my instructions to you twice but it appears that you only received them once. I am glad you enjoyed your stay, you are welcome back anytime. If you want a true blue Kiwi bach experience... this is it! A well equipped and very clean original style kiwi bach with a few extra mod cons (new shower, toilet, freeview tv etc). Great views and west facing. Certainly worth putting on your short list for the future holidays. My sister and I had a great time in spite of poor weather. The bach is well set up but we could have done with a few more instructions about the lighting set up in the kitchen. However, we had a small problem with the tv and Linda could not have been more helpful with resolving this - which was much appreciated. All in all it was money well spent. The view from the main bedroom is just marvellous - well worth a visit we felt. All good and most helpful owner. Thank you Linda. This is the most beautiful bach hidden away just outside of Opononi. The sand flat out front is perfect for exploring, searching for cockles, watching sting rays, and wading. At high tide, you can easily take the kayak out to explore the surrounding areas. Just around the corner from the house is a nice place to fish for snapper. The house is equipped with almost everything you would need and the view from the main bedroom would make it a perfect couples get away.